Our Emergency Department team of medical professionals has made a commitment to see patients within 30 minutes. 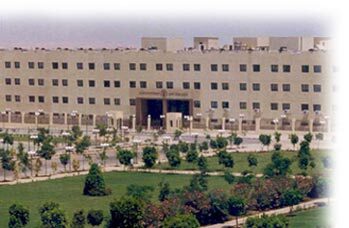 October 6th University Hospital is one of Egypt's leading medical institutions. Founded in the year 2000, on 4500 Sq m, the hospital consists of four stories, surrounded by spacious green areas and located in the convenient spot between 6th of October City's two ring roads. The hospital was perfectly designed to combine spaciousness, serenity, comfort and elegance of design as befits the grace of October 6th University, which founded the hospital with the aim of building a comprehensive medical facility that complies with ISO standards, ensuring sustained development and rendering high quality services to the Egyptian community. 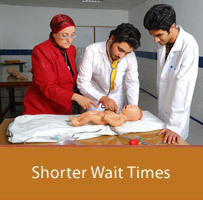 The medical facility comprises 320 beds, a number of which are being used for educational purposes by medical students, the rest are used for economy and paid medical care, including first class hotel suites and single air-conditioned rooms.. A team of competent physicians, including university staff and consultants in all specialties, attend to patients' needs. Moreover, well-experienced specialists and nursing staff contribute to the success of the overall organization. October 6th Hospital is, above all, equipped with state-of-the-art equipment and devices used to serve all diagnostic and treatment purposes, complying with the highest and most advanced medical standards. Mission : The mission of October 6 University Teaching Hospital is to apply not only the reference academic standards but also implementing the international standards for quality control to deal with patients' health problems efficiently, effectively and ethically. Also, our institution aims to provide proper diagnostic and therapeutic services with high precision to meet the social and community needs and recommendations. The hospital aims to improve the skills of the employees through continuous medical education program designed to enhance patient outcomes and contributes to solve the community health problems of the city and region. Vision: The vision of October 6 University Teaching Hospital is to be one of the most reputable medical centers in the region. This is achieved by merging excellence in clinical practice & experience, with education and research. Why 6 October University Hospital ?